Chapter Eight goes beyond the scope of our Colonial focus of 1774, yet these stories will come up during any walking tour or presentation. You seem to know John Brown well from US History. His story and Elijah Lovejoy’s story are combined well here to show how the issue of slavery that was artfully compromised in the creation of the Constitution was still causing strife in our nation’s social, economic and political fabric. That said, focus carefully on Prudence Crandall’s story. Many issues carried on after this case. Note how one of the legal opinions written for this case was later cited in the famous 1857 Dred Scott fining. 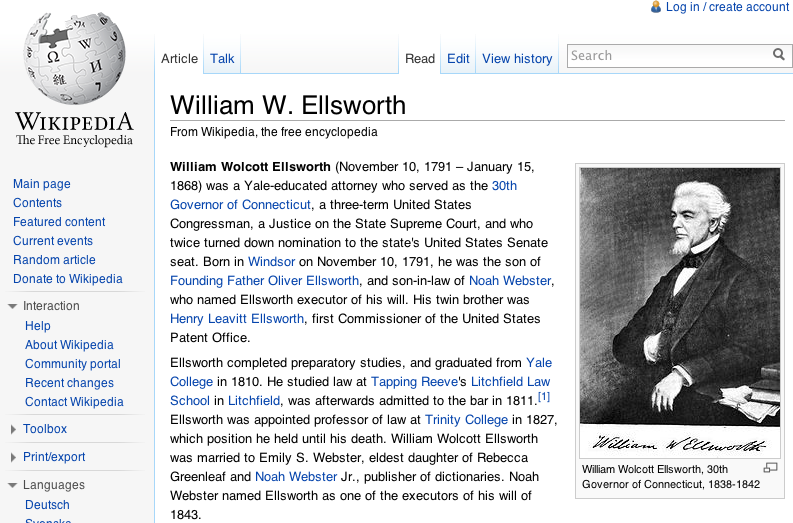 Or you could focus on Crandall’s defense as the Ellsworth family was from Windsor. Remember when we went on our trip to Windsor and we passed the family estate? It was also the place where Washington stopped on his way to visit Suffield. This entry was posted in Slavery and tagged Complicity. Bookmark the permalink. 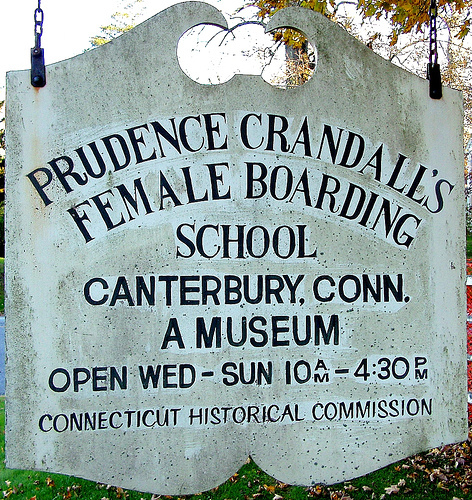 Prudence Crandall opened up a school in Canterbury, Connecticut that was open to black girls. This was a very controversial thing to do back then and the parents started withdrawing their children from the school. Crandall believed that education would prove colored people to be equal to whites. The townspeople targeted Crandall and her students with their anger. They filled their wells with manure and threw eggs and rocks at the school. Since we are discussing slavery, I found it very interesting that Prudence Crandall was responsible for admitting Sarah Harris to his school. Though she received a substantial amount of negative backlash, Candall stuck to her word when she stated, “For I should not turn her out”, when one stated that this action would sink the school. Even after contemplations of moving the school and threats from the community and the court, Candall stood strong and persevered. After her reputation hit rock bottom, she stated, “In the midst of this affliction, I am as happy as any moment in my life.” This statement depicts bravery, determination, and courage. I was very impressed by her notions and actions, which led me to give her a substantial amount of respect. In an attempt to prove to an ignorant nation, that in fact white and blacks were equal, Prudence Crandall opened up a school that focussed on the education of young black girls. The town of Canterbury refused to allow any such actions. Townspeople threw bricks into the windows of the school, and contaminated the school’s well by dumping manure into it. Crandall refused to close his school in the midst of such great adversity. understand that savory was continued for unlawful gain. In some ways Crandall’s experiences help to illuminate the deep dislike that prospers when different class systems become drastically separated. This phycological occurrence of separating the “strong” from the “week” happens all throughout history. From event’s like the Holocaust to everyday stereotypes that happen in high school sitcoms, degradation of the week is a cautionary tale to the world of how power and greed are the true evils not color or class. After Prudence Crandall agreed to have a young black woman attend classes at her school in Eastern Connecticut, Crandall and her students became targets of the communities anger. White parents began taking their daughters out of the school and everyone was against Crandall and her belief that education would prove her black students were equal to whites. In May 1833 the Connecitcut Legislature passed the “Black Law” which made it illegal for out-of-state students of color to attend school without local permission. This was just so Crandall could not have black students from other parts of the area in the school. If the Canterbury school was not a national experiment Crandalls arrest sure was a national statement to all states who challenged the Constitutional right of citizens rights who had been denied to the rights that they were already given. Prudence Crandall did something that most people wouldn’t dare do in her time. Crandall admitted a young black girl to her school which caused an uproar in the community. Crandall refused to make her leave the school causing parents to take some of their children out. In retaliation the townspeople vandalized the school by poring manure in the school well, and pelting the school house with rotten eggs and stones. Crandall was still true to her word and did not stop teaching the black girl. She felt that if black children were educated they would be equal to white children, and stay that way as adults. Crandall had a vision, and nobody was going to stop her. “Mr. May(an abolitionist in support of the school), we are not merely opposed to the establishment of that school in Canterbury; we mean there shall not be such a school set up anywhere in our State. The colored people can never rise from their menial condition in our country; they ought not to be permitted to rise here. They are an inferior race of beings, and never call or ought to be recognized as the equals of the whites”. Even through a set of court battles eventually dismissed the townspeople continued to pressure the School and as a result it was closed after a (arson) fire.